Regular readers will know that I abandoned my original Brompton pedals a long time ago. I bought a pair of Shimano PD-M780 SPD pedals and fitted them on to my Titanium Orange Brompton. They have proved to be a great addition. Once we started to approach winter I took these pedals off my Titanium Orange Brompton and fitted them to my Original Orange Brompton so that I could have all the benefits of being clipped in on my daily commute. 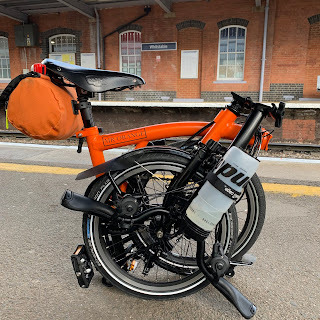 (My Original Orange Brompton being my commuter hack, winter and generally horrid weather bike). Not wanting to swap pedal over I had fitted a pair of Shimano M520's to my Titanium Orange Brompton, borrowed from a friend but did not really like them too much. They have a smaller area and I always preferred the slightly larger surface area of the M780's. With the weather appearing to be getting better I thought I would take the plunge and just buy another set of clipped in pedals. This proved to be an easy decision. As you can see from the photos I opted for a brand new pair of M780's. These will be going on my Titanium Orange Brompton and staying on. I really like this pedal. They look good, have that larger surface area than the M520's and M540's but are lighter than them too. These new pedals are very well greased and will be like an old friend returning when fitted to my Titanium Orange Brompton. The addition of a pair of cleats in the box is always welcome and will save me buying a second pair for my new SPD shoes. Clipped in isn't for everyone, especially on a Brompton for several reasons. First it means you do not have a folding pedal. Second you really do have to wear shoes with cleats to pedal in rather than almost anything on the original Brompton pedals. Finally, so people just cannot get used to them. As I said I haven't looked back and now relish that clicking in sound when the cleat engages with the pedal. My original blog post on these pedals can be viewed by clicking on the link below. I bought a pair of 780s after reading your earlier blog posting, and I like them too. Like you, I have also bought a second pair - this time for my trusty 18 year old Giant X-1500 hybrid bike. I need to get round to fitting them, but I've been using the Brompton more often than the Giant these days. Thanks for the tip about the 780s. The original brompton pedals really are hurting my feet so either I switch to a bigger pedal or change my shoes.